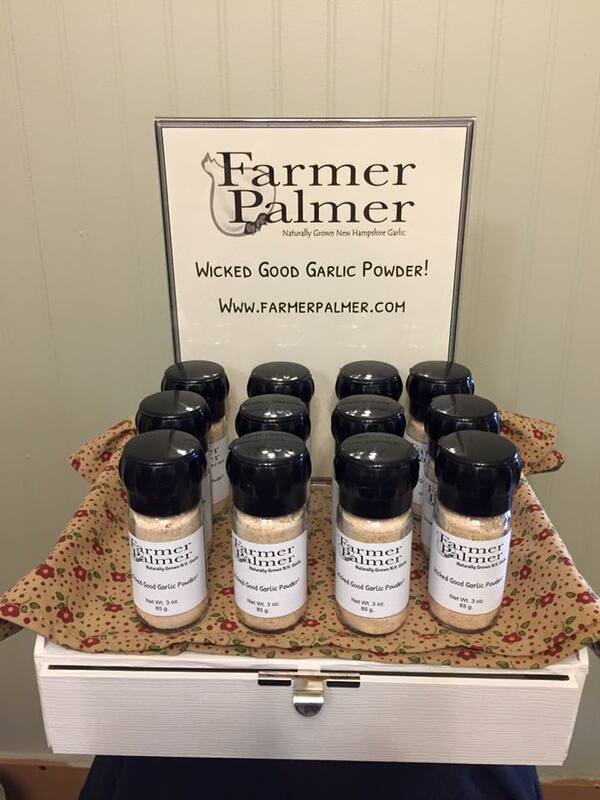 Farmer Palmer produces Certified Naturally Grown garlic from our family farm in Derry, New Hampshire. Our two main products at this time are our Wicked Good! Garlic Powder and fresh Garlic Scapes. We have worked hard over the last seven years to multiply our own seed from 180 original cloves, purchased from an organic grower, to the 10,000 we have planted for this Summer's harvest. We usually grow up to 10 varieties, trying out a couple of new ones each year purchased from an organic grower. We plant, pick, and process our garlic by hand. Our garlic varieties are mixed together and slowly roasted to get a beautiful caramel color and complex robust flavor. Our powder is packaged in a glass bottle with a reusable grinder top to bring out the fresh flavor and scent with every grind.